There are no vertical variations between the trains and the platforms. At Arlanda, you can take a lift directly between the platforms and air terminals. Persons with mobility impairments who are confined to wheel-chairs and those with visual impairments may be accompanied by an assistant free of charge. A special area for wheelchairs an a spacious WC with a nursery table are located in one of the mid-train carriages of each train. Guide dogs may accompany their owners at no additional cost in all carriages on the Arlanda Express. The Arlanda Express provides assistance from our platforms at Arlanda Airport to the respective terminals and airlines. Tell our train attendant when beginning the journey if you need assistance from the station to the terminal. They will then help you to arrange that. There are also so called "pick up points" at our stations at Arlanda where you can arrange assistance via intercom. 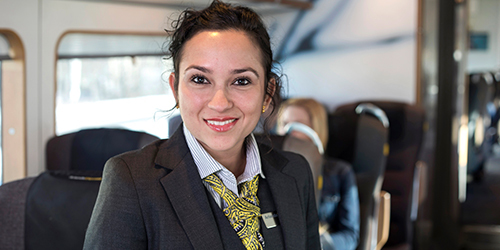 You can travel with the Arlanda Express using your special transport services card from the Stockholm County Civil. You do not need to buy a ticket in advance, just show your card on board the train. The journey is paid for afterwards via an invoice along with other special transport services. Please call Special Transport Services at +46 8 720 80 80 if you have any questions. Our trains are built to be sufficiently spacious and comfortable for all sorts of air travellers with all types of baggage - from small briefcases to extra large suitcases. Place your baggage in the roomy baggage racks located at each carriage door. For reasons of safety, please keep the aisles and doors free from baggage. The highest permitted weight per item is determined by your airline. For those of you travelling with large/heavy baggage please take the lift instead of the escalator to avoid accidents. You can charge your mobile devices on board our trains. Their are power outlets in almost every seat. We offer free wifi on board our trains. There is a specially designated space for wheelchairs and prams in one of the train's mid-train carriages. We observe the airline's guidelines when it comes to bikes. Bikes need not to be packaged, but keep in mind that they must be placed so that they don't prevent other passengers or personnel from passing. If travelling with a dog or other smaller pet, it must be kept in a cage or equivalent enclosure as stipulated by your airline. If you have a pet with you, we ask that you sit in one of the train's mid-train carriages, identified on the outside with a pets-permitted sticker, so as not to cause discomfort to persons with allergies. This does not apply, however, to guide dogs for those with visual impairmments who may naturally ride in any carriage. As a passenger on the Arlanda Express, you are always responsible for your baggage, just as when you fly. This entails that you may not carry dangerous goods or objects that can injure or cause inconvenience and discomfort to other passengers, or to Arlanda Express.